Yesterday we announced a new set of Content Marketing Best Practices research that we are very excited to offer from industry leading third party firms Forrester Research, Aberdeen Research and the Content Marketing Institute. 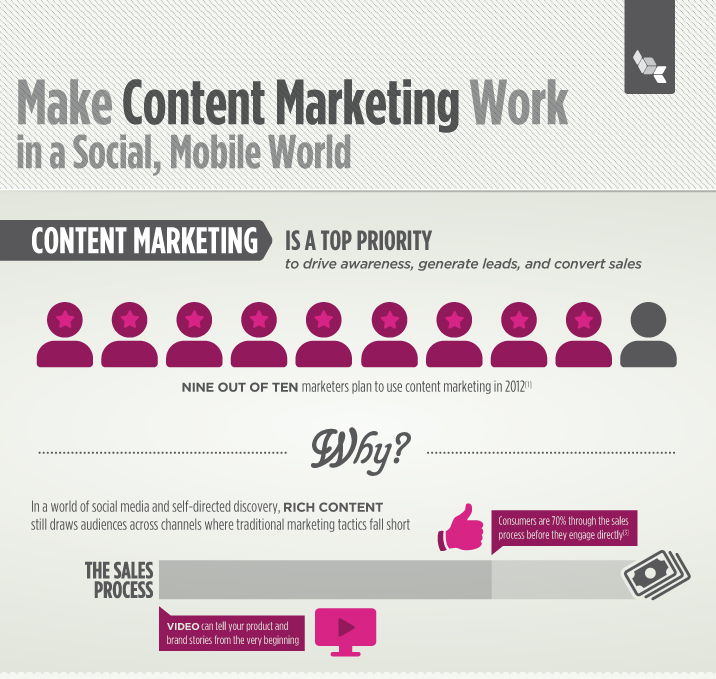 This research package also includes a cool new infographic that we published on "Making Content Marketing Work in a Social, Mobile World", which was also highlighted today by Business Insider. The infographic includes really interesting data around why content marketing is a top priority for marketers seeking to drive awareness, generate leads and convert sales. But, as the data shows, multi-channel content marketing is hard, with massive audiences spread across different social networks, platforms, mobile devices and connected TVs. This leads to platform fragmentation, high development costs and confusing analytics for marketers. The good news is that marketers don't need to solve this problem all on their own, as cloud-based video and mobile app solutions like those from Brightcove are this complexity. These solutions enable marketers to break through the noise and amplify their content marketing efforts to ensure they are reaching their audiences on every screen. You can check out the full infographic at brightcove.com/makeitwork. And you can download the full Content Marketing Best Practices research series at http://go.brightcove.com/forms/brand-research-bundle.